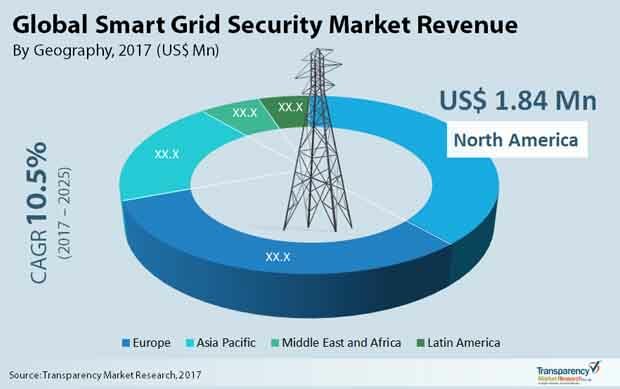 The growth in the global smart grid security market is correlated to the growth in population and the swift pace of urbanization in developing economies. This is because, hard-pressed to serve the ever growing energy needs of the urban population, energy resources companies are increasingly turning to smart meters and smart appliances by leveraging Internet of Things (IoT) and cloud. This also makes smart grids highly vulnerable to various cyber-attacks, thus spawning a security market which is meant to bulwark them. Posing a major challenge to the global smart grid security market, on the other hand, is the long investment cycles in the energy sector that makes technology assessment difficult and leads to a time lag between implemented and up-to-date solutions. Currently, the global smart grid security market is fragmented on account of the presence of numerous diversified local, regional, and international vendors who offer various services to the power utilities. In many countries, the market is dominated only by the local or regional vendors and this is probably intensify competition in the years ahead. A report by Transparency Market Research predicts the global smart grid security market to progress at a healthy CAGR of 10.5% during the period between 2017 and 2025 to become worth US$10.58 bn by 2025 from US$4.35 bn in 2016. The global market for smart grid security can be segmented based on the type of security into application security, database security, network security, and endpoint security. Of them, the network security of smart grid security holds most of the share in the market. The segment is expected to make good progress in the next couple of years too. Network security includes approaches and practices to monitor and prevent unauthorized access, modification, misuse or denial of a network accessible resources and computer network. The application security segment, on the other hand, is predicted to clock maximum growth. Application security entails steps taken to improve security of an application regularly by uncovering and tackling security issues and also preventing them. From a geographical standpoint, the global smart grid security market is being led by North America, which currently holds maximum share and is slated to expand at a healthy clip in the next couple of years. In 2016, the North America market accounted for a share of 38.7% in the global smart grid security market. Technological progress is one of the key drivers of growth in the region which has resulted in a shift toward digitalization of grid systems, especially for commercial usage. The U.S., in North America, holds dominant share. Europe, powered by the U.K, France, Germany, Italy, and the rest of Europe, trails North America vis-à-vis market share in the global smart grid security market. Growing technological progress in the grid systems and security systems is spurring market growth in the region. In terms of growth rate, however, Asia Pacific is expected to surpass all other regions by registering a CAGR of 11.3% from 2017 to 2025. This is mainly on account of the swift technological developments in the energy and power industry across different countries, especially India, China, and Japan. Some of the prominent participants in the global smart grid security market are Intel Corporation, Siemens AG, Symantec Corporation, IBM Corporation, Cisco Systems, Inc, Leidos Holdings, Inc., Honeywell International Inc., BAE Systems Plc., N-Dimension Solutions Inc., and AlertEnterprise Inc. The outcome of installation of smart grid security systems is data collection and use for perfect modeling of networks especially at LV (low voltage) level. Increasing installation of smart grid systems due to more active distribution, exploiting active and reactive control capabilities of distributed energy resources. This factor is acting as a driver of this market and is expected a significant growth during the forecast period. Smart grid security is a very advanced energy distribution solution for their target consumers. It has the highest adoption rate in North America. In Europe, smart grid security is popular in the U.K., Germany and France among others. Japan holds the largest market for smart grid security in the Asia Pacific followed by China. There are opportunities in developing nations such as India and Africa. North America is the largest market for smart grid security at present. Asia Pacific is currently the fastest-growing market and is expected to become the largest market during the forecast period. The market of smart grid security is segmented into three categories: by deployment, by security type and by application. In terms of deployment the market of smart grid security is segmented by cloud and on-premises. By security type the market of smart grid is segmented by database security, network security, application security and endpoint security. In terms of application the market of smart grid security is segmented by smart meters, smart application, renewable energy resources and energy efficient resources. Additionally, technological developments are a major driver of the smart grid security market. The infrastructure is gradually shifting toward digitalization of grid systems, especially for commercial usage, which is anticipated to propel the market for smart grid security over the forecast period globally. This drives the global smart grid security market positivelyand is anticipated a robust growth during the forecast period. However, consumer’s lack of awareness about power supply is resulting in a declining growth rate of smart grid security industry. Therefore, before executing the smart grid concepts, the consumers need to be aware about this systems and its contribution towards low carbon economy and its benefits. Moreover, the developing nations such as India, Brazil and others are slow in adopting the smart grid security systems. Therefore there is medium impact of this restraint and is expected to decrease during the forecast period. Additionally the idea of a smart grid security rises up out of the combination of the power frameworks perspective of the power grid with its comparing data systems view. The consolidated view that uses the data system to upgrade the working of the power matrix is for the most part what is known as the smart grid security. In terms of security type the market is segmented by database security, network security, application security and endpoint security Database security refers to the aggregate measures used to ensure and secure a database or database administration programming from ill-conceived use and malicious dangers and attacks. It is an expansive term that incorporates a large number of procedures, devices, and techniques that guarantee security inside a database situation. In addition, Network security comprises of the approaches and practices received to monitor and prevent unauthorized access, modification, misuse or denial of a network accessible resources and computer network.